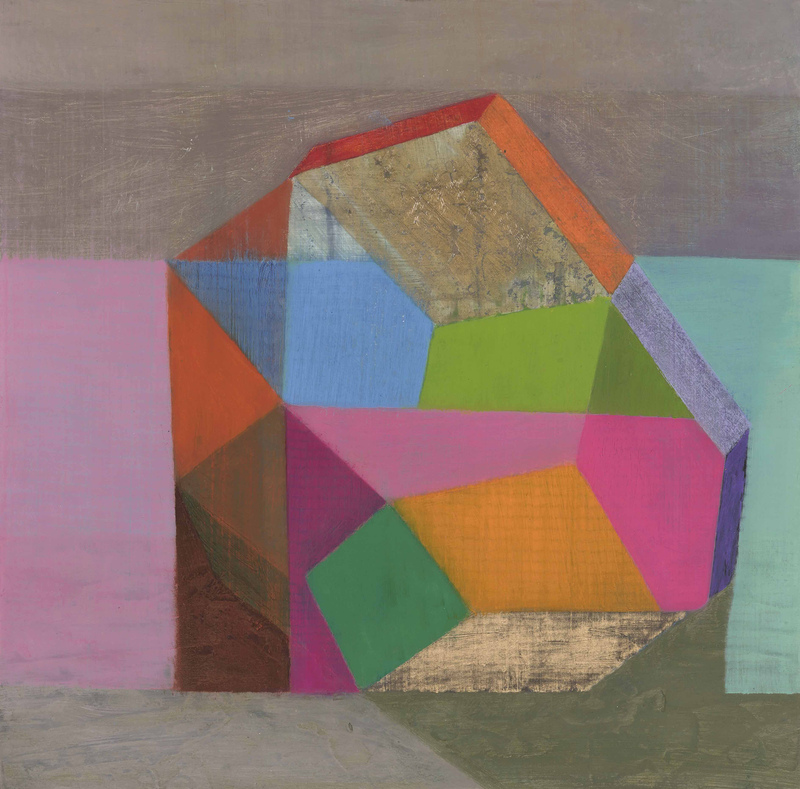 Irish painter Tom Climent produces paintings of figurative, urban and landscape subjects, sometimes referencing the history of painting in his works. His most recent work tends to focus on the creation of a structured space, while investigating the boundaries between abstraction and representation. These investigations are performed using paint. As traces of memories and feelings accumulate and overlap on the canvas, construction and deconstruction become active tools in the creation of his paintings. Referencing landscape, various types of structures and natural phenomena, the compositions range from the visually complex to simple basic structures. His manipulation of the materials, scale and weight of these structures obscures their basic properties and any identifiable purpose. His work touches on our relationship with the spatial, formal and emotional qualities of architecture. It suggests a narrative but never actually revealing what that might be. 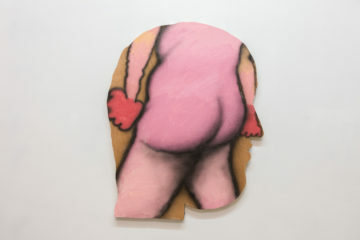 Tom has participated in group exhibitions in London with the Herrick Gallery and in New York with the J. Cacciola Gallery and The Painting Center. He is a recipient of the Heinrich Boll Cottage Residency, Ballinglen Arts Foundation Fellowship 2016, Cork City Council Individual Artists Bursary Award 2014, Working Art Grant 2014, Tony O’Malley Travel Award, Victor Treacy Award and a Department of Foreign Affairs Travel Award. His work is in the collections of The Irish Central Bank, The Irish National Treasury Management Agency, University College Cork, University College Dublin, University of Limerick, Smurfit Business School, AIB Bank, The National Self-Portrait Collection of Ireland, NCB Stockbrokers, The Cork Opera House, Cork City Council, The Irish Office of Public Works, Cork Institute of Technology, The American Embassy in Dublin, Deloitte, Investec and private collections in Ireland, UK, Spain, France, USA & Canada. We were recently granted the opportunity to ask Tom a few questions about his work and practice. 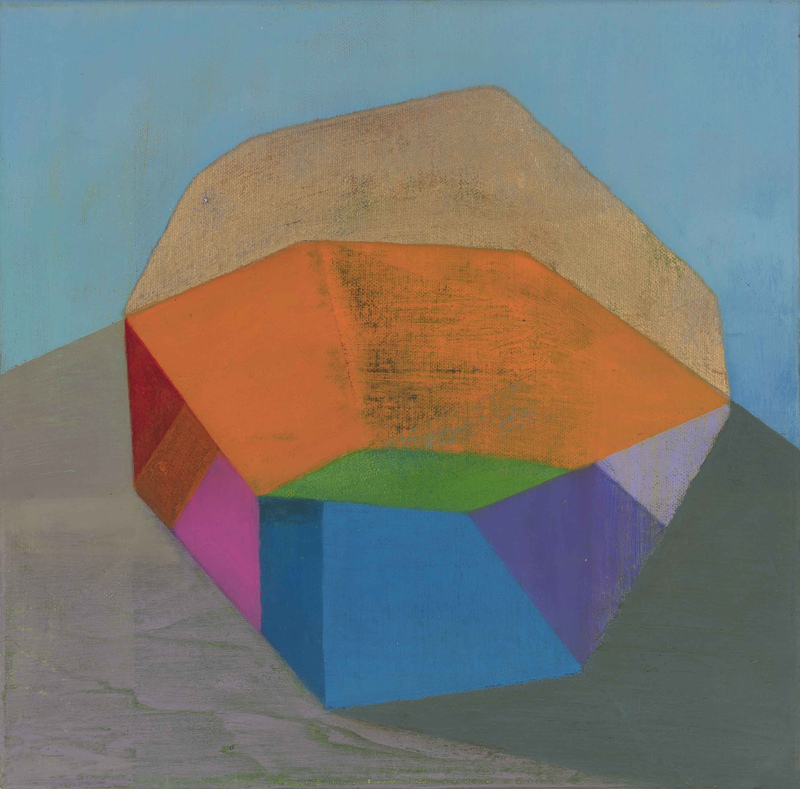 AMM: Let’s talk a little bit about your main focus in painting, which is currently landscape, various types of structures and natural phenomena reflected in simple geometric shapes. Could you expand more on your creative focus and do you feel your work is evolving in any way, if so – how? TC: I feel more comfortable talking about the how of the paintings rather than the why. It’s a hard thing to explain-why do I paint the works I do? I suppose I see them as this continuous thread, from the beginning of when I started getting interested in art and artists when I was around 15 or so to the present day. The work I looked at back then was from the turn of the last century: Impressionism, Post-Impressionism, Cubism, Fauvism, Expressionism. Painters I loved were Matisse, Vuillard, Bonnard, Gauguin, Cezanne, Picasso as well. It’s where my work has come from and is grounded in. I think in the first few years after college I probably wasn’t that successful in being critical with myself, I didn’t have that external input from tutors. Overtime I became more disciplined in both how I worked and how I viewed my own work. I think you can convince yourself sometimes that the work you’re doing is good, it’s by engaging more with other artists, curators, gallery owners and collectors that you can start to see your own work as other people might see it. Just physically getting the work out of the studio and seeing it in other venues became really important in developing my painting practice. For me painting is trying to find a balance between being unselfconscious, allowing the work to be formed and also making critical judgements about what work you want to make. It’s a process of doing the work and then reflecting on that work, seeing what comes out of a period of painting and then deciding on and why certain paintings I feel are more successful than others. These paintings then become almost like signposts in the road ahead. They guide the series of work forward. A few years ago, in 2009 I decided to go back to college to do a research Masters. I felt that I was missing that critical input that you get by being in college. I wanted to challenge myself and be challenged by others. I wanted to investigate the ways I had of seeing and thinking about my work. Sculpture was a new direction I wanted to explore, and I also wanted to try and engage more with current art practices. I found the experience of it quite hard for the first year, I hadn’t realised that having worked on my own for so long how difficult and uncomfortable it would be to have other people involved in my own creative process. By the second year though I felt much more involved with it. 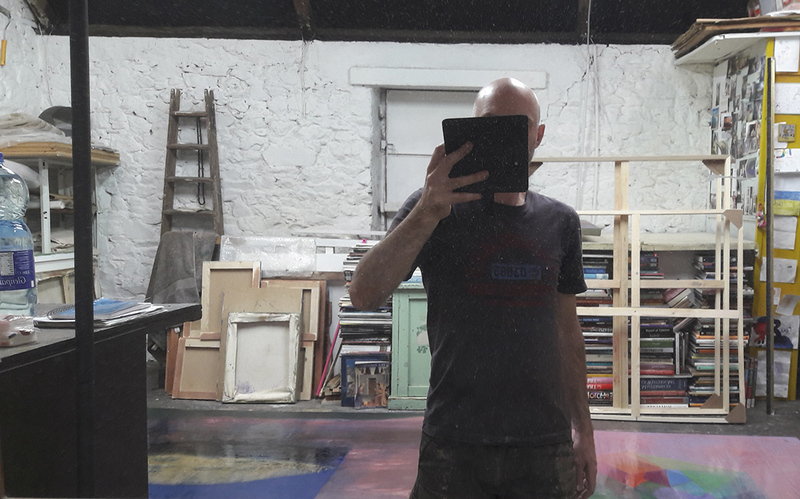 I took a space in the National Sculpture Factory in Cork, this was a great experience and really contributed to the work I ended up doing for my end of year exhibition. I saw the MA as a separate project with a start and a finish, although I really see the influence of the work I did then coming through in the current series of paintings I’m working on. AMM: Tell us a little about your creative process. How do you begin a new piece — with an image in mind or a particular idea? TC: When I start on a new series, it’s a quite natural undertaking. It has a beginning and comes to an end quite naturally as well; I feel I shouldn’t make any more of them. When I start on a new series I can’t really see what they are supposed be, but I have a rough almost hazy image of them in my head. It’s by painting them that they become clearer. I’ll probably be a bit lost at the start, but eventually one or two will start to make sense and be closer to what I feel I’m trying to do. These almost become like markers, they become the first templates and a reference point for the work as it moves forward. I suppose then over time the work takes on a life of its own, and moves forward under its own weight. This new series has followed on and is determined by the past series I’ve worked on. Around 2007/2008 my work was quite abstract and I felt ‘flat’ in structure. 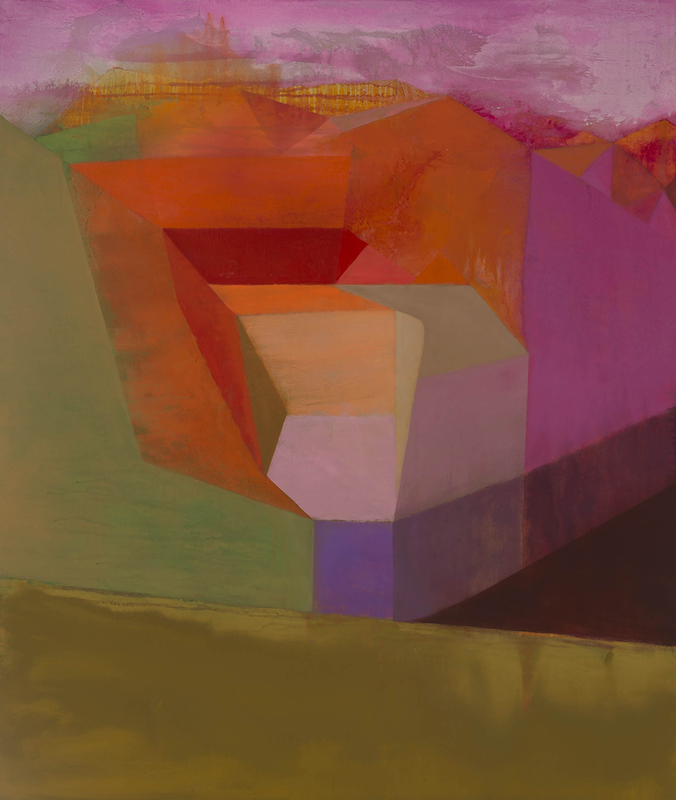 I was using different planes of colour, but in a horizontal way, I felt there was no depth to the work. I started looking at architectural drawings and then different building structures. These became incorporated into the work I did after then. This new series has followed on from this change in the work. Once I have the geometric structure in place, I paint flat on the floor then. I apply layers of very transparent paint with turpentine, the accidents and chance elements that come out of this process guide the painting forward. 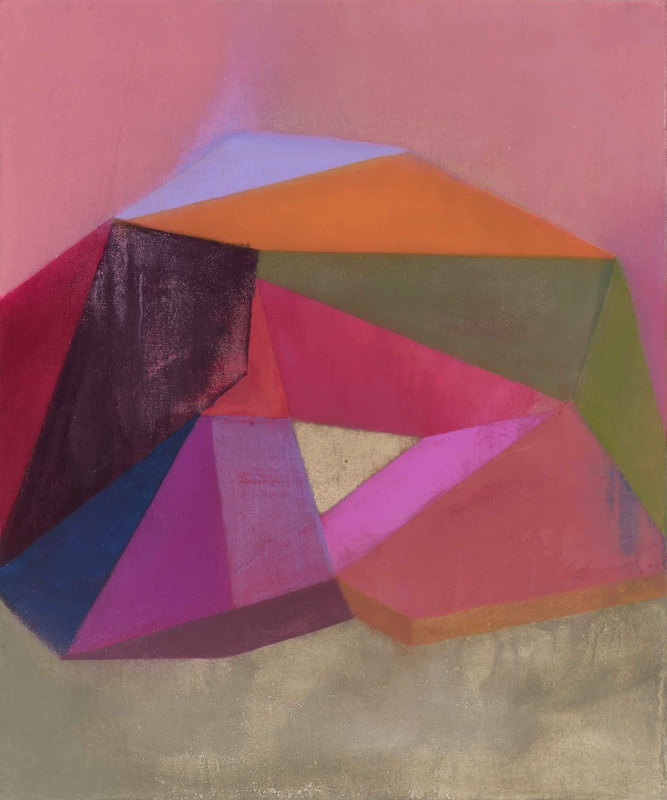 The shapes and narrative that come out of the combination of structure and chance determine what the painting will be. I see this new series as being grounded in landscape. I suppose they are imaginary, even idealized places. Some of my most recent exhibition titles have been, A Place Found, Season Map and Quadrants. I suppose they are about searching for something, for some place. Valleys, mountains, fields seen from above, are all elements in them. I think though as well this idea of a journey, of searching for something relates for me to the act of painting itself. Painting is the means by which I search. The paintings themselves are the by- products of this search. TC: I tend to work a bit in isolation, I don’t share a studio space and over the years the work has become quite internal in nature. Each series following on from the previous one. I don’t draw or sketch. I start each piece I suppose with a rough idea, but I don’t have a definite end result in mind. I want it to reveal itself to me. Each painting is part of whatever series I’m working on at a particular time, in that way the previous pieces I’ve done are almost like sketches for the newer work. I hope as the series progresses, the work will get stronger. I usually go back then and rework the earlier paintings. Each one is like a step on a path, by retracing your steps you make the path stronger and clearer. I found early on in my career and especially while at college, you’re constantly searching for a way and a means to express yourself. There are so many influences and opinions, from artists whose work you admire, the tutors there, your own fellow students. It’s a time where you start to make decisions as to what you’ll take on board and what you feel doesn’t work for you. I think by nature I’m quite unsure, I found that by being challenged /encouraged helped me develop a means of problem solving in a visual way. There were times back then where I would get quite stuck, the tools I learned then to move beyond a certain limit were probably the most valuable I learned as an artist. AMM: What does having a physical space to make art in mean for your process, and how do you make your space work for you? TC: I’ve been in my studio since 1994. It’s become such an important component of the painting and my development as an artist. Having a continuous space to work from has really grounded the work. When I first moved there it really felt I was starting the journey to becoming an artist. I used to share the space but now have it all to myself. It’s split over two floors. The downstairs I use to store work and show it to people and the upstairs is the main working studio space. Over the years I’ve done it up bit by bit. Recently I got new spot lights and a clean viewing area, which has been great for showing the work and photographing it. AMM: What kind of experience do you want a viewer to walk away with? 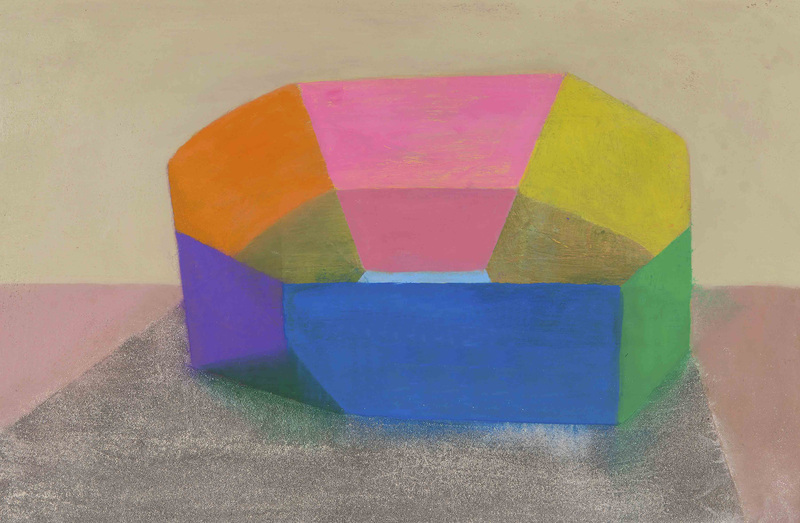 TC: What has always fascinated me about painting is the ability to make a flat two dimensional surface seem three dimensional. This idea of creating space has been the cornerstone of my practice. From the early gestural paintings to the more structured work of the present, creating space that the viewer can enter has been one of my main interests. The abstract structures in the paintings are a mechanism that invites the viewer to a threshold, searching for orientations to see and make the world anew. 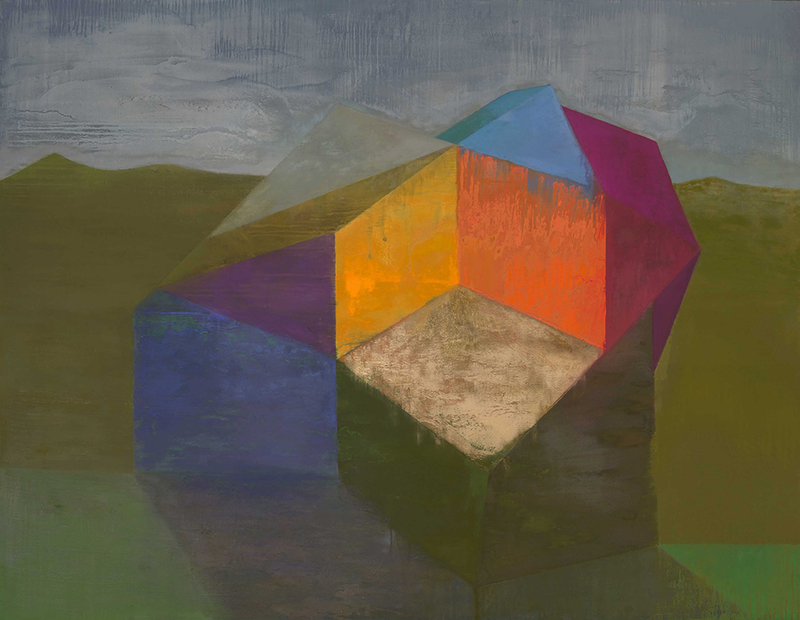 The paintings hold merging references with architecture and landscape painting to generate works of contemplative shelter, ritual and hopefulness. 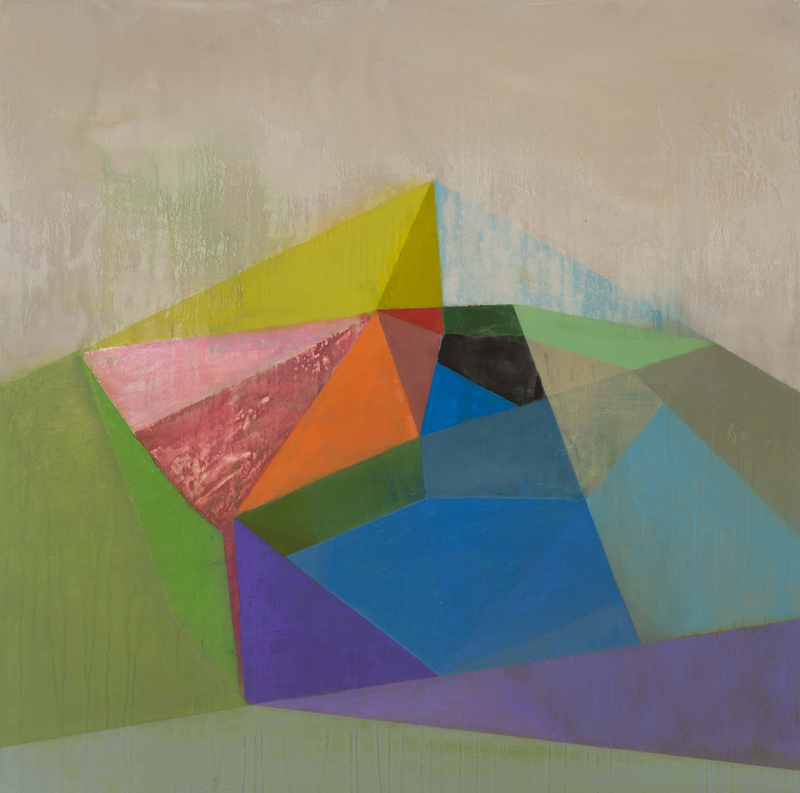 This new work references landscape, various types of structures and natural phenomena. The compositions range from the visually complex to simple basic structures. The manipulation of the materials, scale and weight of these structures obscures their basic properties and any identifiable purpose. It suggests a narrative but never actually reveals what that might be. 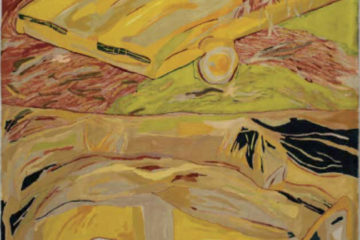 The surfaces of the paintings are quite important as well to the experience of the work. I want them to tell a story in themselves as well. They are the history of the painting. I try and allow that history to be visible in the finished works. When I start a piece I first paint the whole surface one colour, this becomes as in music the key note of the painting. With this new series, I’ve been using abstract geometric shapes and structures, almost like grids, to provide a foundation for the paint. I then start to shape them into something more recognizable, I don’t think the work I do is wholly abstract. I want there to be some way into them, some element or narrative that the viewer can relate to. I think all the work I’ve done has existed on this border line between abstraction and representation. I hope that the paintings are open enough that people can attach their own experiences and history to them. TC: There was very much when I was starting off outside influences, now however the works themselves become almost self-generating. Each one and each series following on and reacting to the last one. In some ways I work quite isolated now, I’m active on social media though and a lot of art that I see I come across this way from what other artists post. 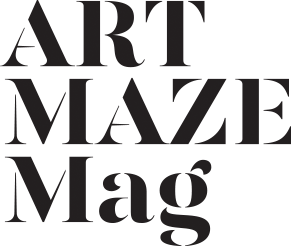 It’s become a great tool to view art and exhibitions. I also travel every so often to Dublin and London to visit shows. I suppose I try almost not to hold a definite end result when I’m painting. I trust that the artists I come across and exhibitions I visit that resonate with me will influence the work I make in a natural unconscious way. 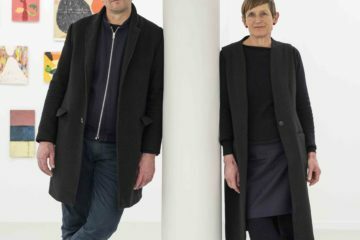 AMM: Over the years how have you navigated your place in the art world? TC: I always had a strong desire and purpose to be a working artist in college. Before going to the Crawford College of Art & Design I studied engineering for two years, giving it up in the third year. During this time I had been doing night classes in painting. This gave me a greater focus to try and make a career out of painting once I had decided to study it full time. During my final degree year I took a studio outside the college, which is still my studio today, and worked from there for my final degree show. I suppose I had a clear idea of what I wanted to do when I graduated. I wanted to have a studio, organise exhibitions and try and get my work known to people. While I was in fourth year I organised my first solo exhibition at a gallery in Cork. It was a space that you could rent out, and it was up to you to organise the opening. It was my first experience of presenting my work to the public, I suppose I’ve always looked at having exhibitions as an important stepping stone in my development as an artist. It marks your work at that moment in time, it gives you as an artist the chance to see much more clearly and critically your current work. It helps you put it in context and allows you to move on from there. Each exhibition you do I hope achieves something, whether it’s new connections to people, sales, reviews or just a chance to see where your work is at and to take stock of it at that particular moment in time. Since then I’ve tried to get my work known to people, to apply for exhibitions and any opportunites to present the work to a wider audience. I work full time at painting and so have to balance between selling work and also be true to the interegity of what I want to paint and also to honour where the work leads me to. It’s changed a few times over the years, some maybe more successfully than others but each change has helped me grow as an artist. 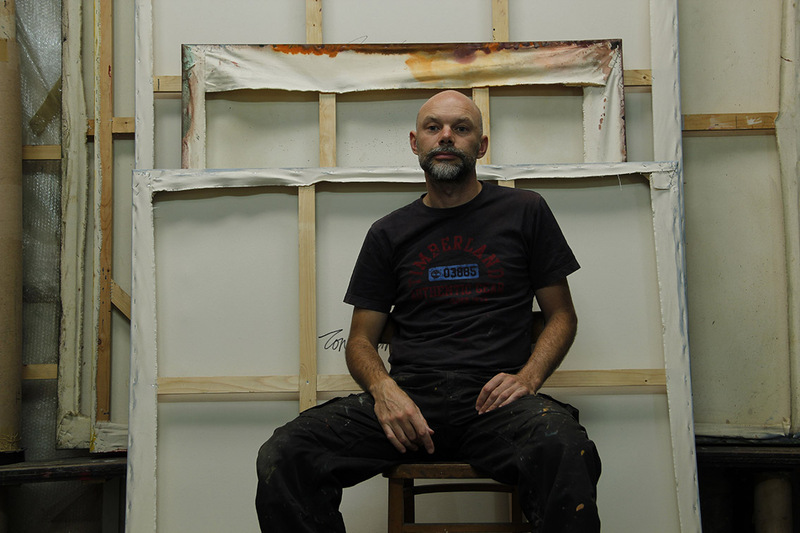 TC: At the moment I’m starting on a new series of paintings. They’re similar enough to my most recent work, but so far seem to be a bit looser in how they’re painted. I’ve been trying to allow the paint to bleed and run more. I’ve also been using sand to build up textures, which is giving them a different look so far. But it’s early days and I’m not sure yet how they’ll turn out. So far this year I’ll just be doing group exhibitions, mainly with a Dublin gallery, Solomon Fine Art. AMM: Do you have a motto, inspirational phrase? TC: Try and build up a regular practice. There are times magic arrives, if you’re there you’ll be able to catch it.